Sime Nugent and Danny Widdicombe, from the three-time ARIA Award nominated band The Wilson Pickers, are sharing their favourite songs on the Stone Pony stage for a special one off performance on Sat 29th December. Sime and Danny will be performing a selection of songs from their solo albums and also from the Wilson Pickers catalogue. Sime Nugent has toured nationally and internationally throughout Australia, Europe and America and released more than a dozen albums with a range of bands in his 20 year career. Sime’s work under his own name; with indie folk duo Sweet Jean and 3 time ARIA nominated band, The Wilson Pickers, has received both critical and popular acclaim. Sime Nugent travels with an extensive repertoire as a soloist , band leader and band member. Danny Widdicombe is a songwriter, singer, session guitarist, musical director, pedal steel devotee and amateur astronomer. He is proudly based in Brisbane, Queensland and has won the coveted GW McLennan Memorial Fellowship and also a Qld Music award. 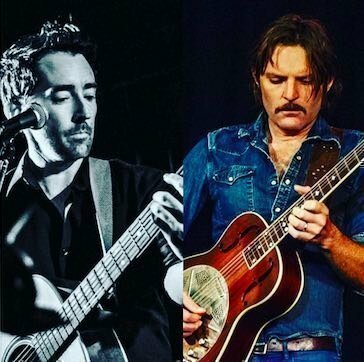 Danny is a member of three time ARIA Award nominated bluegrass supergroup The Wilson Pickers, collaborates with the modern jazz band Trichotomy, plays regularly with his band The Honey Sliders and is also a member of the iconic Brisbane band The Go-Betweens. You can also catch Danny playing lead guitar or pedal steel for the likes of Bernard Fanning, Tim Rogers, Shane Nicholson and many others. Danny recently released an album of ambient electronic music called “Ambrosia”, and a new album with the jazz trioTrichotomy is due for release in 2019. Courtney and Snooks move between the lines of alt-country- infused folk and blues. Robb’s charged vocal delivery demands something of her listener as the imperfections and fragility of her stories reveal themselves. Together with La Vie's soaring harmonica they create a unique and compelling sound, encompassing a soulful pop sensibility that has seen the duo attract the attention of local and interstate music festivals and music lovers alike.